Why Can’t Superman See Through Lead With His X-Ray Vision? Superman could probably see through lead with his X-ray vision if he really tried. It’s just that his inventors, Jerry Siegel and Joe Shuster, told him that he can see through anything but lead, and like any good cartoon character, he faithfully obeys his creators. Siegel and Shuster’s idea seems to have been that X-rays can’t penetrate lead. Otherwise (the reasoning goes), why do X-ray technicians hide behind a lead-lined wall when they zap you? Why do dentists drape you with a lead apron when they shoot your teeth? Lead is indeed used as radiation shielding throughout the world of nuclear research and technology. But the truth is that there’s nothing special about lead at all. It simply does the job more cheaply than other materials. X rays are just one kind of electromagnetic radiation, pure energy that zips through space at the speed of light. Other kinds of electromagnetic radiation that are more familiar outside the doctor’s office are light itself, the microwaves that cook your food, and the radio waves that carry all those programs to our radios and televisions. All of these energy waves are vibrating up and down and sideways as they fly along. In fact, their energy consists of these vibrations: a higher frequency of vibration, more vibrations per second, means a higher radiation energy. They line up this way in order of increasing energy: AM radio, short-wave radio, television and FM radio, radar, microwaves, light (both visible and invisible to humans), X rays, and gamma rays, the last of which are emitted by radioactive materials. Being of such high energy, you might expect (as if you didn’t know) that X rays are very penetrating radiations. They go through flesh like a bullet through Jell-O. Bones block them just enough to throw diagnostic shadows on a sheet of photographic film. The bad news, though, is that X rays, like gamma rays, are ionizing radiations. That is, as they plow through atoms of flesh, bone, or anything else, they knock out electrons, leaving behind ions, atoms that are missing some of their electrons. And without going into detail, let it be said that atoms that are playing without a full deck of electrons are, to mix a metaphor, loose cannons in the chemical game of life. They can disrupt our body chemistry in strange and unhealthful ways. That’s why we want to shield ourselves from X rays and other ionizing radiations, such as those that come from radioactivity. What, then, shall we use to stop X rays? Anything that offers lots of atoms with lots of electrons to knock out, because each time a beam of X rays dislodges an electron from an atom, it costs it some of its energy. So the more atoms with lots of electrons we can put in their way, the sooner the rays will lose all of their energy and stop. The best X ray stopper, then, is whatever substance has the largest number of electrons per atom and is the most densely packed, with the largest number of atoms in each cubic inch. Uranium would be just dandy. It has ninety-two electrons per atom and is nineteen times as dense as water. Gold would be great, too: seventy-nine electrons per atom and slightly denser than uranium. And then there’s platinum: seventy-eight electrons per atom and twenty-one times denser than water. But alas! These substances are all too expensive. And who wants to escape X rays by hiding behind a wall of radioactive uranium, anyway? But some X rays will always get through a sheet of lead or anything else, no matter how thick. It’s just that the thicker the layer, the fewer will get through. In theory, a beam of X rays can never be stopped completely by any thickness of any material. We can only reduce the beam to a relatively harmless level. Of course, you can use an even cheaper, if less effective, X-ray stopper than lead; you’ll just need more of it. A thick concrete wall, for example, will do the same job as a relatively thin sheet of lead, even though concrete isn’t an near as good an X-ray absorber, thickness for thickness. If you have lots of room for shielding, you can even use the cheapest of all materials: water. Only ten electrons per molecule, but with enough of it between you and the X-ray source, you’re safe. Siegel and Shuster may have known all of this, but admitting it would have spoiled a great literary gimmick. So Lois Lane can rest easily after all in her belief that lead-lined clothing foils X-ray vision. Until old mild-mannered Clark wises up. When Did Superman First Appear In Action Comics and Where Did the Name Superman Come From? 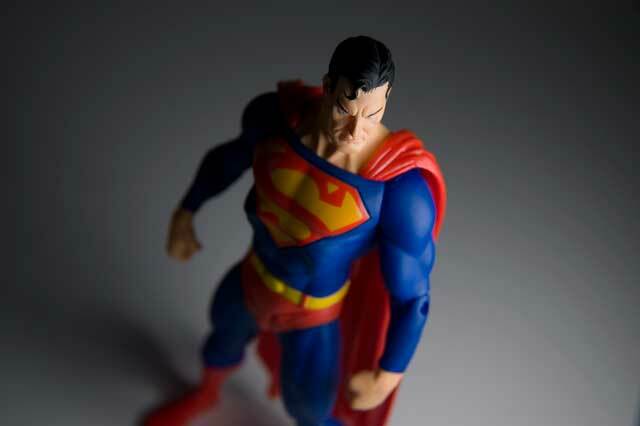 Where does the word “superman” come from and What does superman mean? Why is pencil lead called lead when they don’t have lead in them?